MONTICELLO, AR (March 14, 2019) – SeaArk Boats is excited to announce the addition to its BC series bass boat line with the all new BC 190. The BC 190 features the Evolution Hull design like its sister boat, the BC 210. This hull features a 10 deadrise and creates better lift, with less water connection and drag. 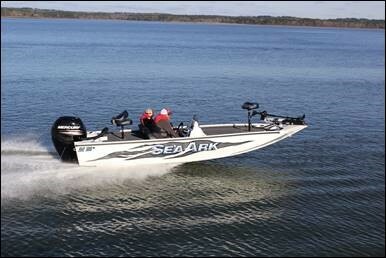 Like all SeaArks, the BC 190 is built with strength and durability as a top priority. Heavy gauge aluminum, all aluminum floors and decks, oversized caprails and extruded center keel. The interior is also a well thought out design. Two lockable rod boxes, four lockable storage boxes, a built-in 39-quart bow step cooler, and 35-gallon livewell are all standard features. The BC 190 also has over 8,200 square inches of fishable deck space. Specifications for the BC 190 are 19’ 6” length, 82” beam, 60” bottom and 175 HP rating. There are many available options including dual consoles, power poles, hydraulic jack plate and Amped Package. The BC 190 will be on display this weekend at the Bassmaster Classic in Knoxville, TN this weekend along with the BC 210.